Denna produkt ger dig 1449 bonuspoäng. Vagnsset med 3 stolpvagnar typ CFL, totallängd över buffertar 68,7 cm, epok VI. Model: All of the cars are loaded with iron beams. All of the cars have different paint schemes and car numbers. The cars have separately applied hand wheels. All of the cars are individually packaged. Total length over the buffers approximately 68.7 cm / 27'. DC wheel set E700580. Prototype: 1 CFL type Rnss stake car. 1 CFL type Res stake car. 1 CFL type Rns stake car, leased to AAE. The cars look as they did around 2013. One-time series. The electric locomotive to go with this car set can be found in the Märklin H0 assortment under item number 36632. All of the cars are loaded with iron beams and have weathering that goes with such loads. Authentic weathering and repaired areas. 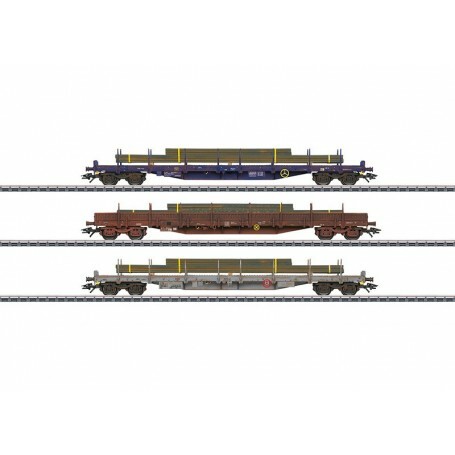 Iron beams as a freight load.